The USC School of Dramatic Arts Career Center offers career services and professional development opportunities to help students establish and sustain successful careers as creators, performers and cultural innovators. 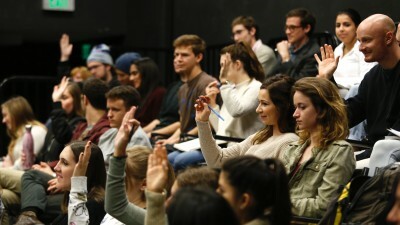 Created in 2017, the Career Center at the USC School of Dramatic Arts offers students career counseling, workshops, visiting artists, information sessions, the School’s robust Career Month offerings and its thriving internship program. Also available to SDA graduates for one year upon completion of their degree are job postings and referrals, submissions and follow up on appropriate projects for actors that do not have other representation, mentorship opportunities, coaching services for auditions and production of self-tapes, consultation on demo reels and websites, guidance and support in choosing headshot photographers and resume advice and counsel. Current SDA students can visit the student portal for more details and registration.